The Presidential Elections Committee announced on Wednesday the final tally of votes by Egyptians at polling stations abroad in the presidential election, showing a huge lead for Abdel-Fattah El-Sisi over his rival Hamdeen Sabahi. According to the committee, the final count of votes show that 318,033 expatriates had cast their ballots in 141 polling stations in Egyptian consulates and embassies around the globe. The overseas stations were open from Thursday 15 May to Monday 19 May. Out of 318,033 votes cast, former military chief El-Sisi won 296,628 (94.5 percent) votes, while Sabahi got 17,207 (5.5 percent). Invalid votes totalled 4,198 votes. In the run-off vote of the 2012 presidential poll – between Islamist Mohamed Morsi and Hosni Mubarak-era prime minister Ahmed Shafiq – 301,720 expatriates cast their ballots out of 586,804 eligible voters, a turnout of 52.3 percent. Unlike the 2012 election, however, voting via mail or email was no longer an option this year, as expat voters had to be physically present at embassies and consulates. However, whether permanently residing overseas, or temporarily out of the country for any reason, Egyptians abroad were allowed to cast their votes without prior registration. Polls in Egypt will open on 26-27 May. I would just like to inform the hateful commenters on here that the opposition candidate (sabahi) representatives where in every country and observed and signed on the validity of the election results. I know that logic won't dissuade you from regurgitating your propaganda. I also know that it is difficult for you to accept that a patriotic egyptian that loves his country can have such popularity while someone like the escaped convict Morsi and his gang can only dream of it in their sick and perverted fantasies. Anyway, Egypt is moving on, and all the haters and terrorists should roost elsewhere if they don't like it. we expected more... about 200 Percent or some think. bade luck sisi's democracy. good luck next time. this result shows that this election rigging galore!! 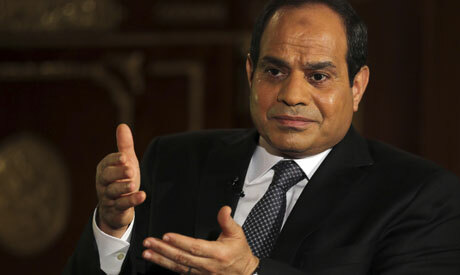 !.ride on el sisi.we will see where you will take Egypt to in the next two years.you will fall from grace like Mubarak did.your deception is now obvious to the people now.I can't imagine how you will rule Egypt for long with this your autocratic and exclusive style.